HANOI, July 20, 2010 (AFP) - Southeast Asian foreign ministers met in Vietnam on Tuesday for discussions dominated by concerns over the sinking of a South Korean warship and elections in Myanmar. Ministers from the Association of Southeast Asian Nations (ASEAN) are meeting in Hanoi ahead of the region's main security forum Friday, which also gathers major powers including China, the United States and the European Union. A draft statement prepared ahead of Tuesday's talks said the 10 ASEAN member states supported a nuclear-free Korean peninsula and urged a resumption of six-party disarmament talks "as soon as possible". "We deplored the incident of the Cheonan ship sinking and the rising tension on the Korean peninsula," the draft statement said, referring to an explosion that ripped apart a South Korean warship in March, killing 46 sailors. It said the six-party talks involving North and South Korea, the United States, China, Japan and Russia were still the "main platform to achieve long-lasting peace and stability". US Secretary of State Hillary Clinton and North Korean Foreign Minister Pak Ui-Chun will attend the 27-member ARF meeting alongside their counterparts from the six-party process. It will be the first time the top diplomats from the disarmament dialogue will be in the same room since the Cheonan incident dramatically raised tensions on the Korean peninsula. 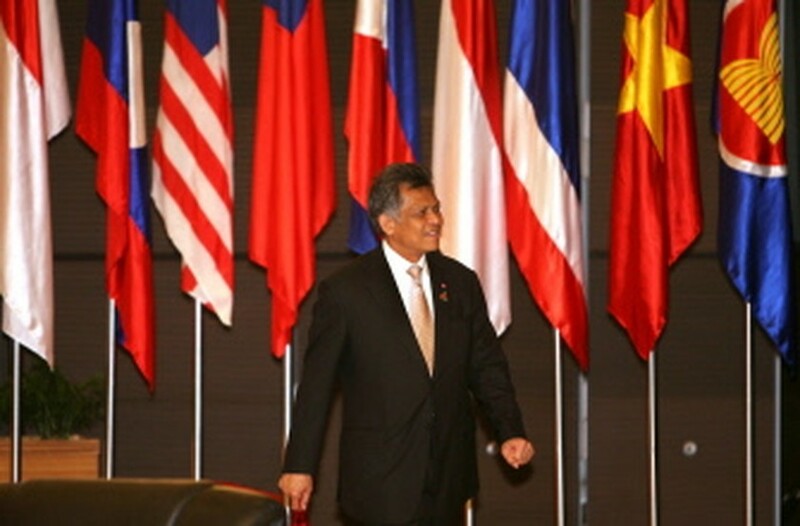 ASEAN chief Surin Pitsuwan said it was an opportunity to "engage in a discussion to see if the six-party talks can be given a new life". Clinton will arrive in Vietnam after visits this week to Pakistan and South Korea, where she is due to attend a memorial for the dead sailors and visit the Demilitarised Zone (DMZ) alongside Defense Secretary Robert Gates. South Korea, the United States and other nations, citing the findings of a multinational investigation, accuse the North of firing a torpedo that sank the warship. The North vehemently denies the allegations and has warned that any attempts to punish it could trigger war. But the country has also said it is willing to return to the multilateral disarmament talks, which it abandoned last year, after the United Nations Security Council on July 9 condemned the sinking but did not assign blame. The United States, which has 28,500 troops in the South, has expressed skepticism about the North's sincerity and responded by announcing plans to hold naval exercises with South Korea starting on July 25. A US aircraft carrier, the 97,000-tonne USS George Washington, and three destroyers will visit South Korea this week ahead of the exercise. During a visit to US troops north of Seoul on Tuesday, Gates said the drills were "a strong signal of deterrence to the North" but were not intended to provoke China, Pyongyang's strongest ally. A draft ARF chairman's statement suggests the security forum is likely to follow ASEAN's lead by expressing concern about the situation on the Korean peninsula without explicitly condemning the North for the Cheonan incident. South Korean Foreign Minister Yu Myung-hwan wants some form of direct condemnation of the North to be included in the final statement, and would oppose any declaration that includes Pyongyang's denials. On Myanmar, the draft ASEAN statement calls for free and fair elections in the member state. Surin said Myanmar Foreign Minister Nyan Win "got an earful" from his ASEAN colleagues on the need for a credible vote. Myanmar's top diplomat "listened very, very attentively" during the discussions late Monday, Surin added. The bloc of almost 600 million people -- grouping Brunei, Cambodia, Indonesia, Laos, Malaysia, Myanmar, the Philippines, Singapore, Thailand and Vietnam -- maintains a policy of non-interference in members' affairs.